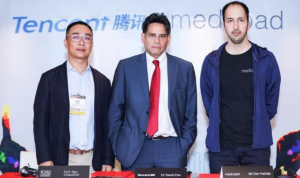 On the 7th of October 2018, Tencent and the British mobile medical company Medopad, together with Professor Chaudhuri held a strategic meeting marking initiation of a novel collaboration. Their aim is to improve diagnosis, evaluation and management of Parkinson’s disease through the use of novel technology in remote and home settings. Dr. Fan Wei, director of Tencent Medical AI Lab, said that in this cooperation, Tencent will provide the AI technology and tools for video analysis of Parkinson’s disease motor function, combined with Medopad’s mobile medical applications, such as medical questionnaires, to jointly promote early diagnosis of Parkinson’s disease. The diagnosis of Parkinson’s disease and its management is often neglected in the elderly populations, especially in those with multiple comorbidities. Early detection of the disease will lead to better management and thus reduce symptoms, prevent and reduce long-term motor complications, and enable the patients to lead a more normal life for many years following diagnosis. Currently, clinicians diagnose Parkinson’s disease using traditional assessments which include clinically validated scales and questionnaires, including a lengthy motor assessment which needs to be carried out in clinic in the presence of the clinician. This method of diagnosis relies on verbal communication and can be suboptimal, given that it relies on the clinician’s subjective judgement of a snapshot of the patient’s state and therefore there is a slight risk of inaccuracy due to lack of objectivity. To this end, Tencent Medical AI Lab, together with Professor Wang Jian of the Department of Neurology of Huashan Hospital, launched an AI model, an intelligent assessment system, for detecting Parkinson’s disease through motion detection. The evaluation process is very simple: the patient does not need to wear any sensors; he or she just stand in front of the camera and follows the instructions to complete a series of actions. Within three minutes the assessment of the motor symptoms can be completed, thus reducing the length of the assessment. Moreover, the assessment can take place remotely without the need of coming to hospital reducing time pressure in clinic and consequently shorten the waiting time for appointments. The international collaboration between Tencent, Medopad and Professor Ray Chaudhuri aims to combine the AI technology with the clinical evaluation of Parkinson’s disease in Europe, connect this to the Medopad platform and work with other data capturing devices, essentially taking Parkinson’s disease and its management into the digital era. This technology will allow for truly objective assessments and it will allow for the detection of even subtle changes that are not always clear to the naked eye. This in turn would lead to a far more personalised and effective management of symptoms and improve the quality of life for people with Parkinson’s. The remote monitoring will also ensure that the patients can be followed up by their clinicians from anywhere in the world, eliminating the need to form a new trust bond with a different doctor if they move away or are on holidays. Medopad CEO and founder Dan Vahdat said: “Medopad’s cooperation with Tencent is based on the vision of both parties wishing to work together to improve the future medical management of chronic conditions. Combining Medopad’s expertise and Tencent’s technical capabilities, we hope to provide clinicians with early access to the technology that will help them help the patients. Through our joint efforts, we hope to achieve the vision of extending the lifespan of millions of Parkinson’s patients worldwide”. Prof Chaudhuri will offer his unmatched clinical expertise and King’s will be proud to lead this novel research in the world of Parkinson’s Disease.